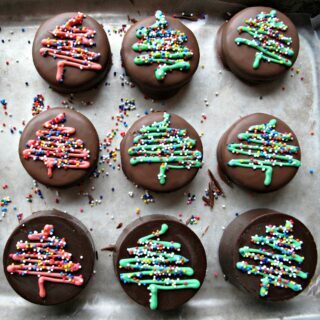 Festive Chocolate Covered Oreos and Iced Christmas Sugar Cookies should bring a bit of holiday spirit to the desert. Though it has only been a few weeks since I sent the November military care package, the December box has been deployed. I hope that by mailing early, Soldier B. will have this care package in time for Christmas. Holidays are an especially hard time to be away from family so I was anxious to send some cheer. Part 1 Care Package Contents: There is no shortage of Dollar Store choices for a Christmas care package. The hardest part is limiting purchases to what will actually fit in the box. I am pretty good at packing and try to fit as much as possible, Tetris style, into the large priority mail boxes that I use. 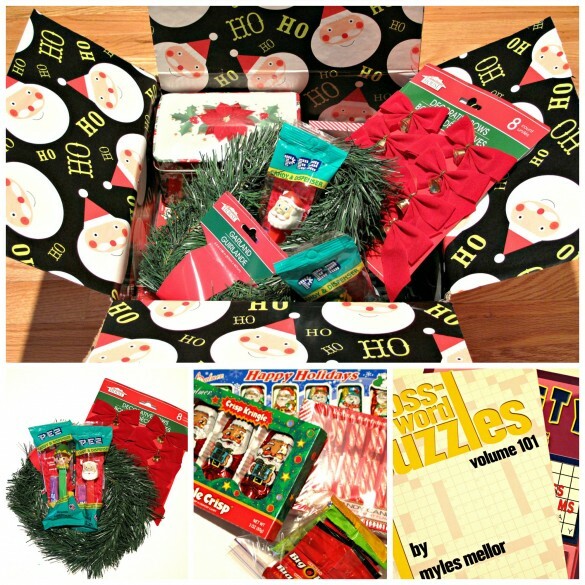 In addition to the homemade treats packed in Christmas tins, this care package includes decorations, Santa chocolates, candy canes, Pez Santa and Elf, and some puzzle books. 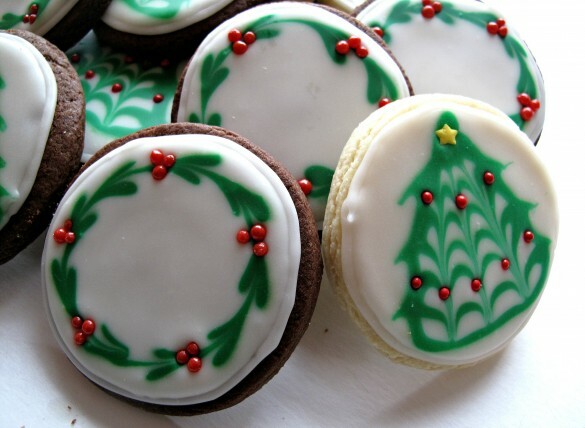 Part 2 Circle Sugar Cookies: When it comes to icing sugar cookies, I am becoming the Queen of Toothpick Designs. Pull a toothpick through icing and amazing things happen. My handy toothpick has so far created shamrocks and turkey feathers. For my Christmas designs, I used a toothpick to form a wreath and a Christmas tree. I used one batch of chocolate dough and one batch of vanilla dough. I decorated twelve vanilla and twelve chocolate circles and froze the rest. The 24 cookies for this care package used 1 batch of faux royal icing. Most of the icing was left white. First, I removed about ½ cup of white icing when it was thick enough for outlining. The rest was thinned slightly to flooding consistency. I removed slightly more than ½ cup of the thinned icing to color green. All of the cookies were outlined first in the thicker white icing, which was allowed to set slightly for about 30 minutes before flooding the cookies. The designs in green and the added sprinkles are done at the same time as the flooding. 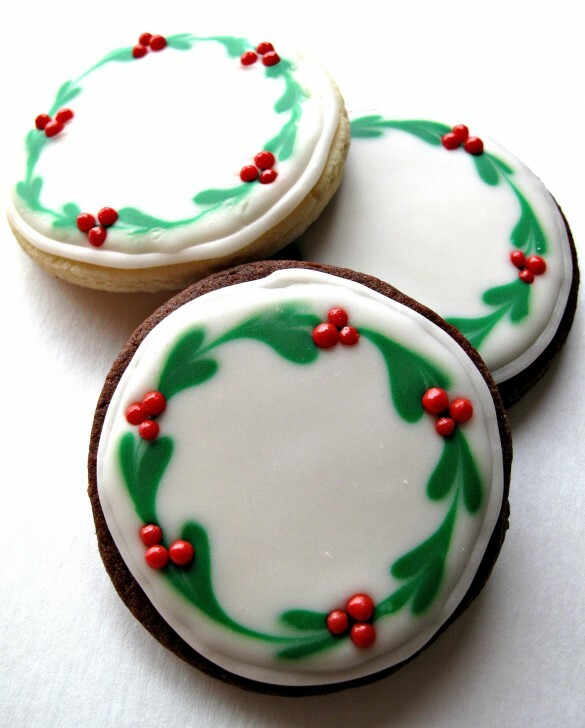 For the wreath cookies, flood the cookie with white, then immediately add 10-12 dots of green around the edge of the cookie. Use a toothpick to gently drag the green icing from one circle to the next. The green shapes will look like elongated heart, but the color and context transform them into greenery. I used tweezers to add red sprinkle pearls for holly berries. 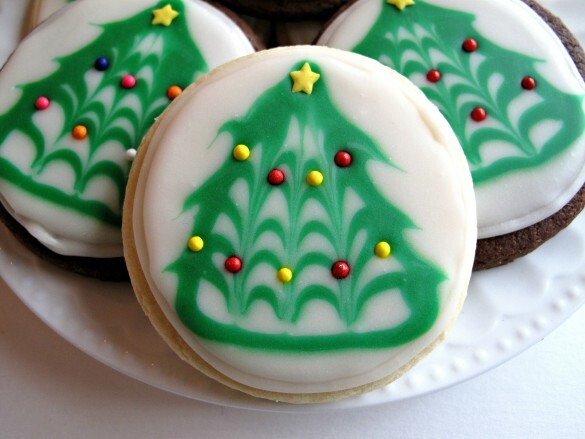 I am especially excited about the Christmas tree cookies, because they are my own design. Immediately after flooding an outlined cookie with white, use the green icing to pipe a large triangle. Add five horizontal lines inside the triangle. Now for the magic toothpick. First use the toothpick to gently drag a bit of green icing outward from the edge of the triangle to resemble pine branches. I did this three times on each side of the triangle. Then, starting at the inside top left of the triangle, gently drag the toothpick down through the horizontal lines to the bottom. Repeat this downward drag in the center and on the right. 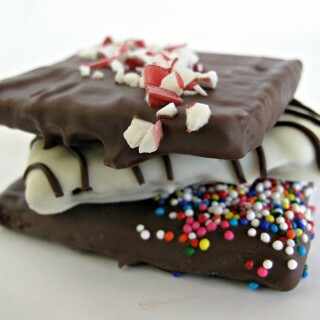 I used tweezers to add a star sprinkle and multicolored nonpareils. Part 3 New Recipe: When Soldier B. mentioned in an email that he especially likes chocolate-mint, I immediately thought of Chocolate Covered Oreos for this Christmas themed Military Care package. Holiday edition mint Oreos gave these treats the flavor combination Soldier B. was hoping for. 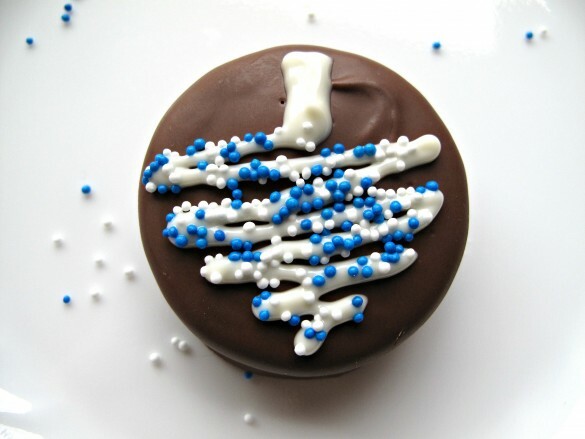 Chocolate covered Oreos are an impressive looking confection that makes a wonderful long or short distance gift. No recipe is needed for making Chocolate Covered Oreos, just some directions that are intended as helpful hints. I use Chocoley Candy and Molding formula. My use Chocoley because it tastes delicious without the hassels of tempering, and stays looking pretty for weeks. (No white cloudiness that can happen when using chocolate chips.) I use the Candy and Molding formula because Oreos are a heavy cookie and I wanted a slightly thicker coating. The creativity is in the decorating. For design inspiration, I find Pinterest to be both a source of wonderment and a curse. There are simply too many ideas to choose from! 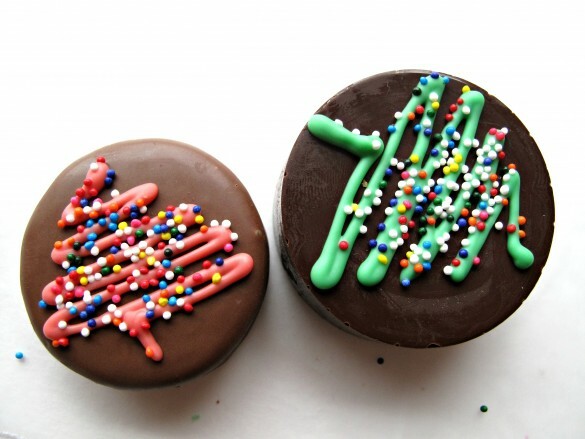 There was no way I could pick just one idea, so I am presenting you with two super simple ways to decorate your Oreos after they are enrobed in chocolate. Guess who is guiding the sleigh to Afghanistan in my care package? 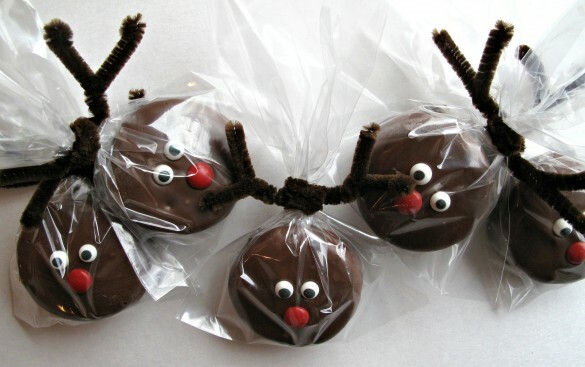 A plain coated Oreo with two eyes and an m&m nose turns into Rudolph when packaged with pipe cleaner antlers. I used a cake pop design with a chocolate covered Oreo instead of the cake pop. 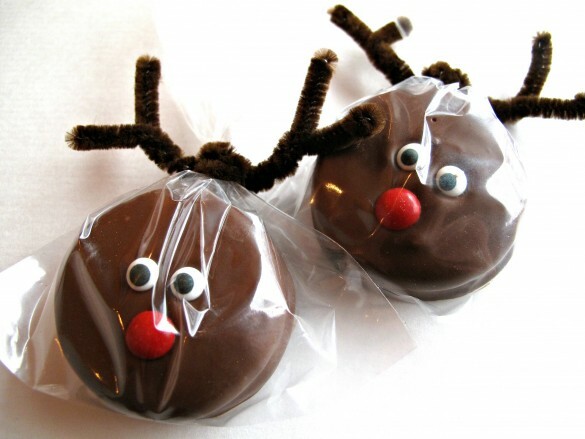 The cookies look like brown blobs with eyes until the pipe cleaner antlers transform them into Rudolph. Super easy and high on the smile inducing scale. Smile inducement is my primary goal for military care packages. The zigzag Christmas tree was also originally a cake pop design. The stylized tree is just slightly more sophisticated than Rudolph, but just as easy to create. I added oil based green and red food coloring for candy making to melted white chocolate (I use Chocoley Drizzle and Design formula) and piped it in a zigzag onto the top of the chocolate covered Oreo. I meant to add a little yellow star sprinkle to the top of each tree, but somehow got carried away with my enthusiastic zigzagging, and by the time I realized I had forgotten the stars, the chocolate had set and the cookies were wrapped. I could have added the stars with a dab of melted chocolate as glue, but it wasn’t worth unwrapping the cookies. Next time. For those of you celebrating Chanukah, I made a design discovery as I was piping Christmas trees. If you pipe the tree in white or yellow and use some blue and white nonpareil sprinkles, an upside down Christmas tree becomes a Chanukah dreidle! I didn’t use the dreidle design in my care package, but I will be using it for family Chanukah baking. Where ever you may be, and which ever holiday you may be celebrating, I wish you all happiness, sweetness, and peace! Use wax paper to line two cookie sheets or other flat baking pans that will fit into your refrigerator. • Place the melting chocolate in a bowl large enough that the chocolate fills it up to 1 inch below the rim. Melt the chocolate wafers in the microwave at 50% power for one minute. Stir. If not completely melted, return to the microwave and heat for 15 second intervals, stirring between intervals, until melted. • Place a cookie into the melted chocolate. Using two forks, press the cookie into the chocolate, then turn it over to coat the underside. • Using a fork, lift the coated cookie over the bowl. Gently tap the wrist of the hand holding the fork to make excess coating drip back into the bowl. Place the cookie onto the prepared cookie sheet. 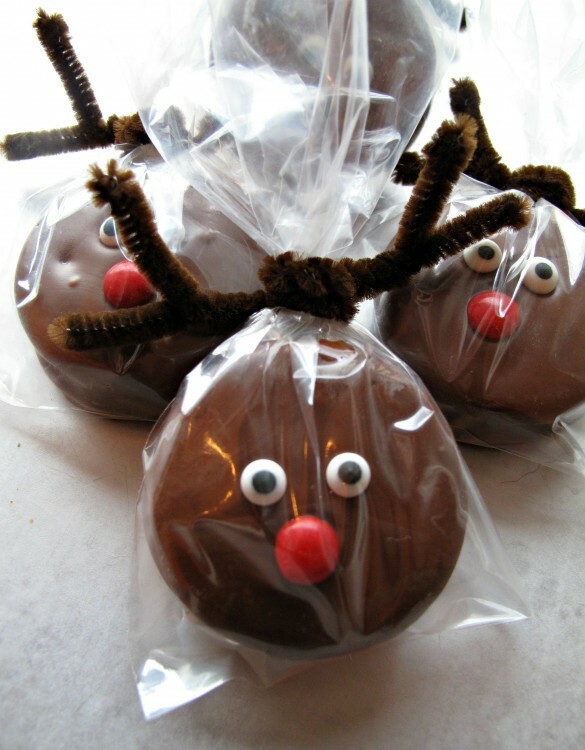 FOR REINDEER COOKIES: Immediately after placing each chocolate coated cookie onto the prepared pan, add the eyes and m&m nose to the top of the cookie. • After coating 6 cookies, place the first cookie sheet into the refrigerator for 10-15 minutes to set the chocolate. Setting in the refrigerator, not at room temperature, will produce slight surface shine. • Complete coating the remaining cookies in groups of 6, rotating cookie sheets into the refrigerator for setting. 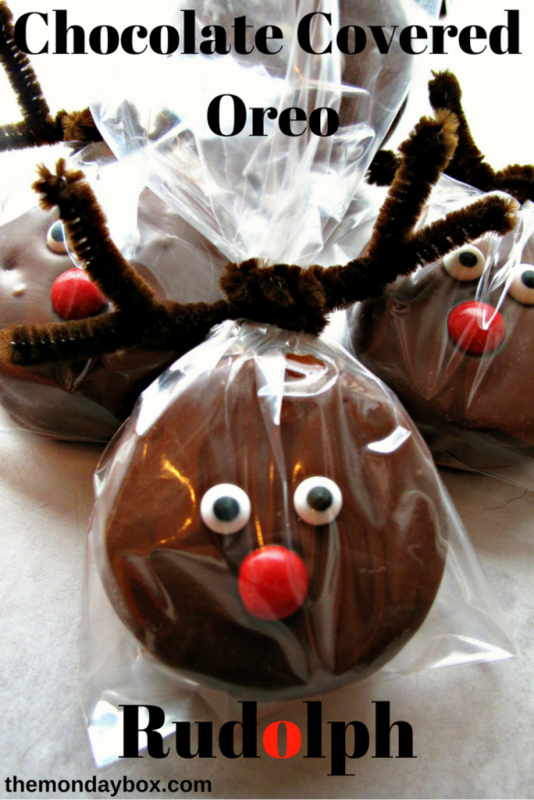 • To wrap and add antler to Reindeer cookies: Place a chocolate coated cookie into a small plastic cookie bag. Cut a pipe cleaner in half. Turn under the tips of the pipe cleaner wires to eliminate sharp edges. Holding the two halves together, twist the pipe cleaners 5 or 6 times until the untwisted ends are about ½” long. Fold the twisted pipe cleaner in half to mark the middle point. Place the middle point on the neck of the plastic bag, just above the coated cookie. Twist the pipe cleaner around the neck of the bag twice. Bend the ends to resemble antlers. • TO DECORATE WITH CHRISTMAS TREES: Place ¼ cup of white melting chocolate into two small bowls. Melt at 50% power in the microwave for 30 seconds. Stir. If not completely melted, return to the microwave at 50% power for 10 second intervals, stirring between intervals until melted. Add 10 drops of oil based green candy coloring to one bowl and 10 drops of oil based red candy coloring to the other bowl. Stir until the white chocolate is evenly colored. Spoon the melted chocolate into two plastic sandwich/snack bags. Cut a very tiny piece off a bottom corner of each bag and pipe the colored chocolate in a zigzag pattern to create a Christmas tree shape. 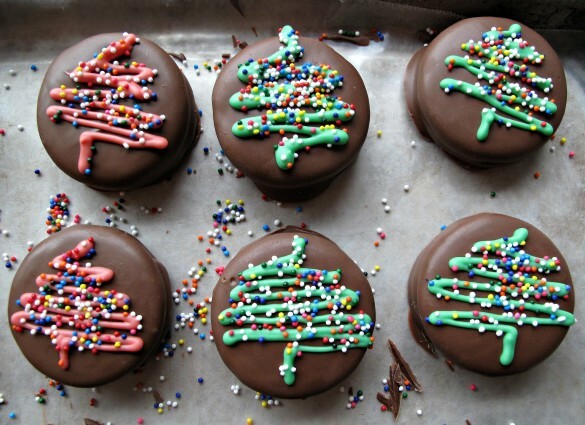 Important: Add sprinkles immediately after creating each tree. The chocolate hardens quickly. 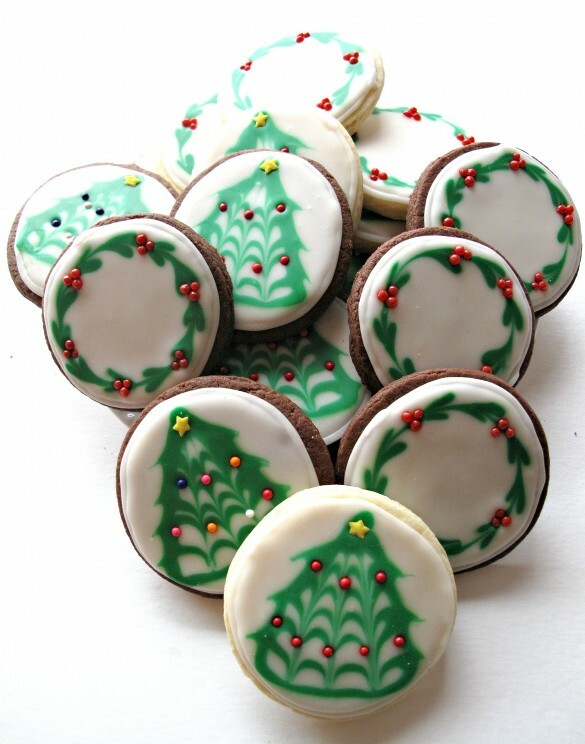 • When all of the coating and decoration has hardened, wrap the cookies individually in plastic bags or plastic wrap. Store in an airtight container at room temperature for up to 2 weeks. 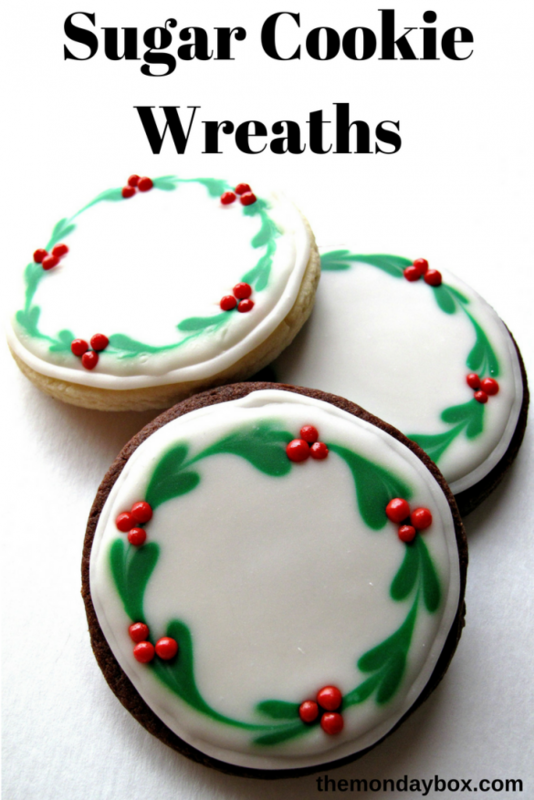 Pack the individually wrapped cookies closely in a box or tin. Add crumpled tissue paper between the cookies and the lid, if necessary, to prevent ANY movement while shipping. Readers of this post have also enjoyed these recipes! Click on the photo for the recipe! These are beautiful and adorable! Well done! These cookies and the packages are just so festive, Wendy! I need to get some of that Bada Bing coating…all these amazing cookies and treats make me want to enrobe something in chocolate right this second! Your cookie decorating is superb, my friend. I love seeing these treats. I need to learn how to decorate Cookies like you… they look so neat and pretty! Thank you, Dini! It would be easy to learn to decorate cookies like me because, I promise, I am a complete beginner! The zig zag Christmas trees are extra easy. I am so glad you like them! These are so pretty Wendy! You’re going to make someone very happy! You really put extra love and care into every box and it shows. Thanks, Mila! A little swirl of color makes all the difference. 🙂 These cookies are all easy to do and your are right, they all make great gifts! thanks for supporting and showing love to the troops! I know they appreciate all that you do! These cookies are lovely and, I am sure, delish too! Supporting the troops is something I feel honored to to do. Baking a few cookies for our military heroes is an easy way to say thanks and share a smile. Your cookies all look amazing! What wonderful treats to include in the care packages! Thanks for sharing at Christmas in July. Thank you, Beverly! 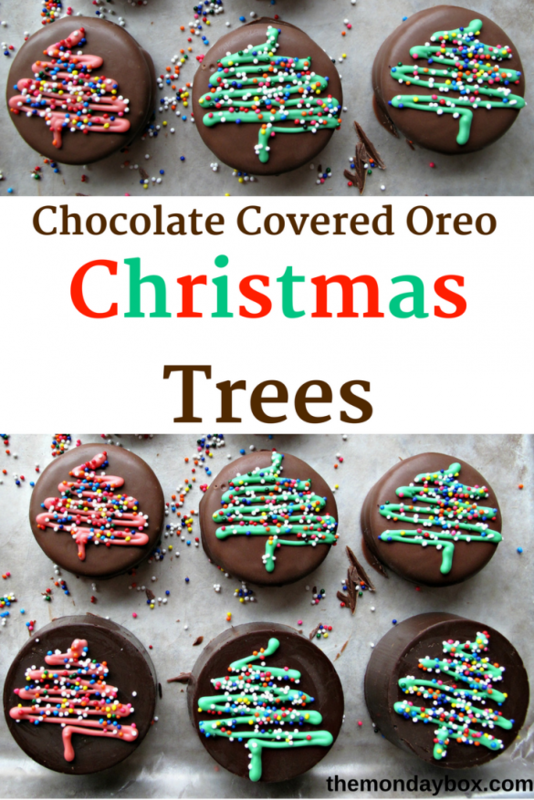 They are so easy to make and Oreos are everyone’s favorite! Thanks for hosting Christmas in July! Where do you find those bada bing chocolates? Hi, Michelle. 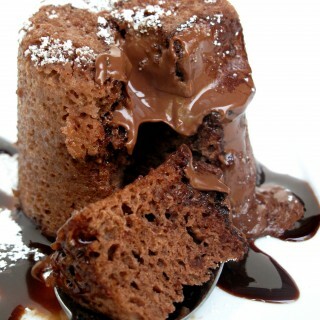 The Bada Bing Bada Boom melting chocolate is made by and available at Chocoley.com . (The words should be clickable on the post and link you directly to the site.) the melting chocolate comes in two levels of thickness. There is the thinner dipping and coating formula and the thicker candy and molding formula. Your cookies are just beautiful and thank you so much for all you do for our deployed military members. We talk a lot about the service they give, but as a family member of some of the active duty members, we thank you for your service to or men and women who serve. God Bless you! Hope you have a fantastic weekend and thanks so much for sharing with us at Full Plate Thursday! I am so thankful for the sacrifices made by our service members and their families. To acknowledge those efforts and to offer thanks is all I can do to support our heroes. It makes me feel good knowing that my cookies and packages can create a few smiles that may brighten the day for our men and women who serve. Enjoy your weekend! They look so cute. Thanks for sharing at Fiesta Friday! Thank you, Kim! I love sharing designs that anybody can do no matter their skill level! I’m a complete beginner myself! The care packages and the cookies hopefully communicate my thanks and best wishes to the troops and bring them a little piece of home. 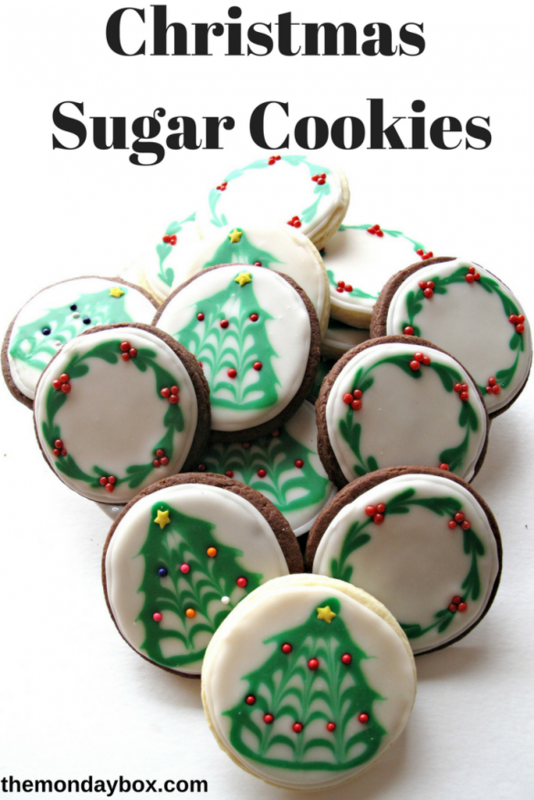 Love both these beautiful, delicious cookies – and the icing tutorial is fantastic! Thank you for sharing with us at Hearth and Soul. Pinned and shared on our Hearth and Soul Facebook page. Thanks, April! I love designs that are easy and doable by anyone! Your hosting and sharing is much appreciated! yummy cookies! What a wonderful way to spread some holiday cheer to our service military members! They do so much and really don’t get the support and recognition they truly deserve. Thank you for this. happy holidays to you! Thank you, Tianna! I really enjoy sending military care packages. I agree, we can’t say “thank you” enough for the sacrifices made by our troops and their families. Wishing you a peace filled New Year! 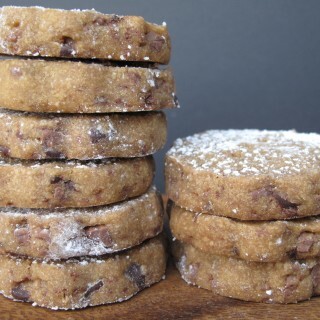 Thanks so much for featuring these cookies, Miz Helen! Wishing you a peace filled New Year! Your cookies are soooo cute! Thank you for sharing at Reader Tip Tuesday.